Lord of the Rings star *Liv Tyler and director Peter Jackson wave to the crowd during the parade for the world premiere of Return of The King, the third film in the Lord of The Rings trilogy, in Wellington, New Zealand on Monday. Wellington - New Zealand's usually sleepy capital came awake in a roar of celebration Monday as stars returned for the premiere of the final film in the Lord of the Rings trilogy, parading through the city in open cars flanked by black-shrouded horsemen, orcs and hobbits that inhabit the beloved novels by J. R. R. Tolkien. Wellington's streets were jammed with 100,000 people standing 15-deep to fete the stars, including Liv Tyler, Ian McKellen, Orlando Bloom, Viggo Mortensen and Elijah Wood. Bloom thrilled the crowd when he opened his jacket to reveal an "I love New Zealand" T-shirt. Mortensen greeted the crowd in Maori, the language of New Zealand's indigenous people. All three films were shot in New Zealand over the last five years. 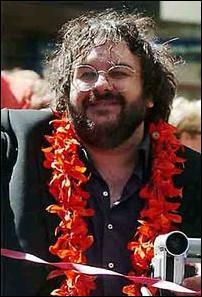 Fans roared as director Peter Jackson - a New Zealander - strode the red carpet toward the premiere showing. "I'm feeling incredibly humbled by this wonderful reception," said Jackson. "You feel like you're the first people to land on the moon or something." After the screening - the first time he'd seen the final cut - Jackson said he was pleased with his work. "I heard a lot of sniffling and sobbing" during the trilogy's emotional climax, he said. "They were cheering . . . and laughing in the right places." "This is a once-in-a-lifetime for New Zealand," said fan Christine Hislop-Croft from the nearby town of Lower Hutt. Wellington's streets were festooned with posters, up to eight stories tall, of Rings characters. Special postage stamps were printed to mark the occasion. Jackson already has anointed The Return of the King as the best of the trilogy. It's also the longest, at three hours, 11 minutes. The film opens in North America on Dec. 17, in most of western Europe the next day and in Asia on Dec. 20. New Zealanders have taken the Rings trilogy to their hearts, recognizing their nation's breathtaking mountains, rivers and forests as backdrops in the films. The countryside "made Middle Earth come to life," Jackson told politicians and guests at a parliamentary reception before the premiere. Jackson said he's now looking forward to working on smaller, local films - "becoming a New Zealand filmmaker again" - although he first must finish another outsized project - his version of King Kong. McKellen, who plays the wizard Gandalf in the trilogy, paid tribute to U.S.-based New Line Cinema for putting trust in Jackson's vision. "It is not often that you can congratulate a studio for courage, good judgment and for backing its filmmaker," he said. New Line Cinema co-chairman Bob Shaye said the company took "a big risk." "After we saw what a great job Peter did we felt incredibly encouraged about the other two," he said as he arrived for the premiere. The trilogy's first two films - The Fellowship of the Ring and The Two Towers - have grossed $2.9 billion US at the box office worldwide. New Line Cinema, a Time Warner subsidiary, is predicting at least $1.3 billion from the third film.